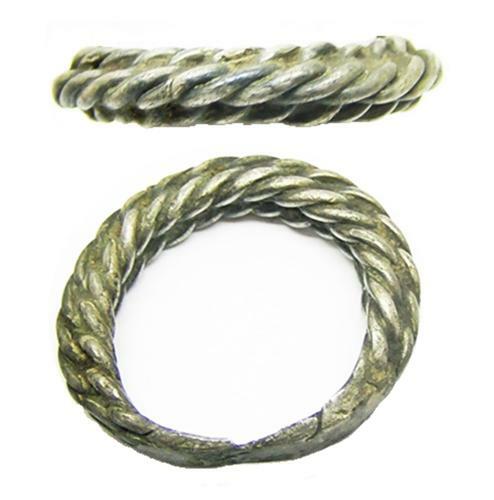 This is a fabulous Scandinavian Viking silver finger ring, dating to the 10th - 11th century A.D. The ring is formed from at least six strands of silver which have been plaited together to form a band. The ring swells at the centre and tapers towards the back of the band where it is welded and hammered flat. The workmanship is very competent and well designed, similar rings in gold have been recorded from Stockley in Wiltshire (WILT-C90DD5), Cromer in Norfolk (NMS-A901E1). A fine example in good excavated condition - wearable with care!